DIE Veneris, 14 die Decembris. 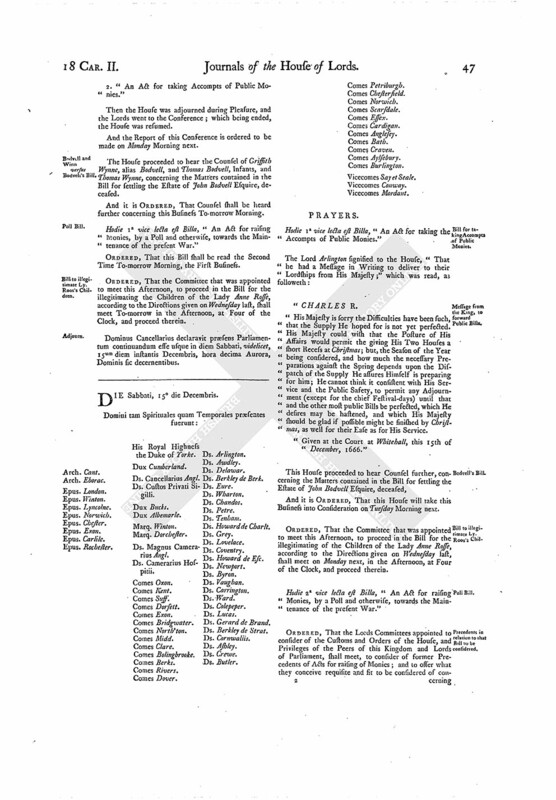 Bill to prohibit the Importation of Irish Cattle, &c.
Bodvell and Winn versus Bodvell's Bill. 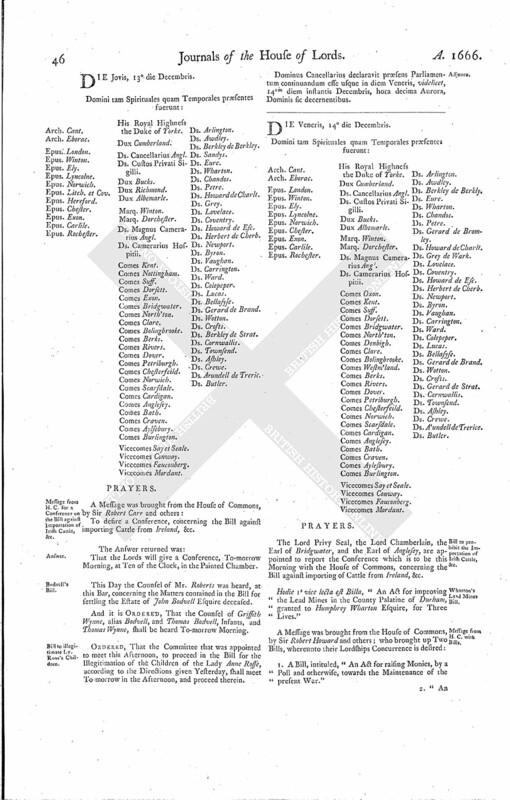 The Lord Privy Seal, the Lord Chamberlain, the Earl of Bridgwater, and the Earl of Anglesey, are appointed to report the Conference which is to be this Morning with the House of Commons, concerning the Bill against importing of Cattle from Ireland, &c.
Hodie 1a vice lecta est Billa, "An Act for improving the Lead Mines in the County Palatine of Durham, granted to Humphrey Wharton Esquire, for Three Lives." 1. A Bill, intituled, "An Act for raising Monies, by a Poll and otherwise, towards the Maintenance of the present War." 2. "An Act for taking Accompts of Public Monies." And the Report of this Conference is ordered to be made on Monday Morning next. The House proceeded to hear the Counsel of Griffith Wynne, alias Bodvell, and Thomas Bodvell, Infants, and Thomas Wynne, concerning the Matters contained in the Bill for settling the Estate of John Bodvell Esquire, deceased. And it is ORDERED, That Counsel shall be heard further concerning this Business To-morrow Morning. Hodie 1a vice lecta est Billa, "An Act for raising Monies, by a Poll and otherwise, towards the Maintenance of the present War." ORDERED, That this Bill shall be read the Second Time To-morrow Morning, the First Business. ORDERED, That the Committee that was appointed to meet this Afternoon, to proceed in the Bill for the illegitimating the Children of the Lady Anne Rosse, according to the Directions given on Wednesday last, shall meet To-morrow in the Afternoon, at Four of the Clock, and proceed therein. Dominus Cancellarius declaravit præsens Parliamentum continuandum esse usque in diem Sabbati, videlicet, 15um diem instantis Decembris, hora decima Aurora, Dominis sic decernentibus.